When the skies suddenly cleared and the sun burst forth in an unusually enthusiastic style this weekend, we knew it was too good to miss and headed out for the day on Sunday. 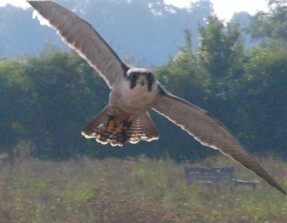 We had decided to visit the Hawk Conservancy Trust, located near Weyhill, just outside Andover. We hadn’t visited the Trust before, but had heard glowing reports from friends within the Sealed Knot. Just before 1:30pm, we strolled through the visitor’s centre and into the main grounds, armed with a complimentary copy of the trust’s highly informative booklet and map. We immediately headed up to watch the “Valley of the Eagles Flying Display”. Very sad news today about the death of Rick Wright, talented keyboard player with the legendary Pink Floyd and often under-appreciated musical craftsman. Wright was part of the core talent of the Pink Floyd sound, having first formed the band together with Syd Barrett, Roger Waters and Nick Mason, back in 1967. He was a key part of the sound, recording and performing with the Floyd from their debut album “Piper at the Gates of Dawn” onwards. As most people will be aware, the world’s largest particle accelerator, the Large Hadron Collider is due to be switched on for the first time, this Wednesday the 10th September. When the LHC switched on, it is hoped that the data collected from the collision of sub-atomic particles will go some way to providing information on how the universe began, right back at the dawn of time, with the big bang. Another contract completed and it’s time to move on again. I’ll miss the team and the interesting work but not the pre-dawn commute to beat the traffic. Feels a bit weird to be largely unemployed again…the last 2-3 contracts have been largely back-to-back and have all been pretty busy, so I’ve not had a lot of time to focus on other things. It’s going to take a couple of days to get into another groove.